Nate Lowman ’s bullet hole imagery evokes a façade of tough guy machismo. Lowman ’s eye-catching iconography is no less a visually communicative explosive force. Sourced from trompe-l’oeil stickers of bullet holes meant to be applied to the glass of car windows, Nate Lowman ’s bullet holes conjured up notions of urban masculinity, menace and aggression. 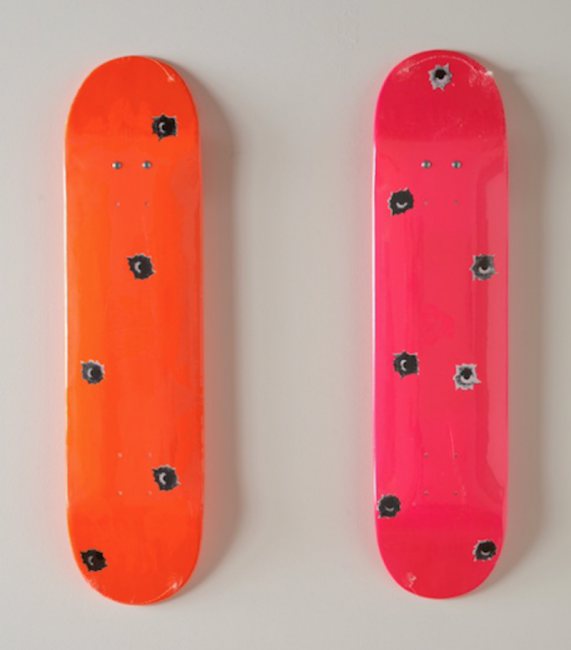 Nate Lowman’s bullet holes are now available on skate board decks for a limited time. Loman is part of a group of New York Artists dubbed “Warhol’s children.” Amongst his peers are the photographers Ryan McGinley, Dan Colen and the late Dash Snow. Lowman brings downtown nonconformity to the mainstream art world with his “bullet hole” paintings. His specialty is connecting the detritus of pop culture with its spectators. Billiantly juxtaposing the raw appeal of familiar cultural debris and an energetic re-examination of Pop Art, Nate Lowman’s paintings are a concise, pulsating summation of the twenty-first century’s visual vernacular. Lowman’s work is frequently guided by the troubling necessity of violence in analyzing and constructing cultural relations. Nate Lowman was born in 1979 in Las Vegas and received a BS from New York University in 2001. His work employs strategies of collage and appropriation, often incorporating and manipulating contemporary visual elements and artifacts such as graffiti, print media, and bumper stickers. The resulting critique of culture reflects on issues such as the cult of celebrity, material consumption, and violence. Lowman’s paintings often isolate common images from popular or consumer culture. In 2005, he created a number of both handmade and graphic works of bullet holes, rendered in a cartoonish Pop aesthetic, which offered a reflection on gun culture. Other works obsessively elaborate on the “smiley face” symbol, ripping it from various sources across decades and locating it in new contexts, including O. J. Simpson’s signature and the logo for Pringles chips. In doing so, the mutability of the symbol and its potential associations with violence, celebrity, and consumerism are highlighted. Turning his attention to the history of modern art, Lowman created a series of paintings in 2011 that reimagine de Koonings Marilyn Monroe (1954). Additionally, he has used common brand images, such as pine tree air fresheners in January Tree (2013) and the leaf from the Apple logo in Splatter Apple Leaf(2014). Lowman has also worked in installation, most notably Wet Pain (2008), a collaboration with artist Dan Colen that featured a 1971 white Jaguar that had been effectively trashed and filled with a tangle of wires. Guy Hepner Contemporary Art Gallery in NYC is proud to present the sale of Nate Lowman Art, prints, paintings, Escalade, Bullet Hole, original artworks. Inquire about prices to buy Nate Lowman art.